Photo credits: Melissa Miner (left), Rachael Williams (right). Sea stars along much of the North American Pacific coast experienced a massive die-off in 2013/14 due to a mysterious wasting syndrome. The disease, called “sea star wasting syndrome” (SSWS) has persisted at low levels in most areas, and continues to kill sea stars. Similar die-offs occurred in the 1970s, 80s, and 90s, but never before at this magnitude and over such a wide geographic area. 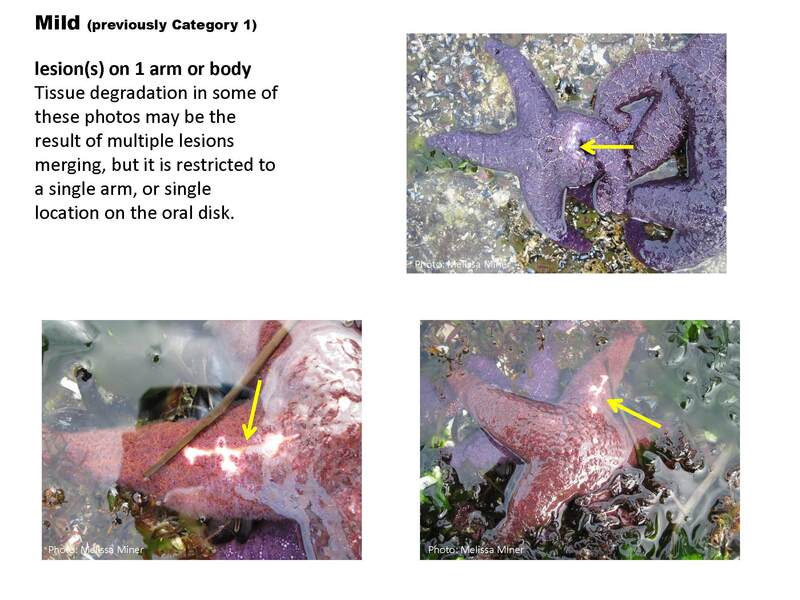 Pisaster ochraceus and at least 20 other species of sea stars have been affected by the current SSWS event. A paper by Hewson et al. 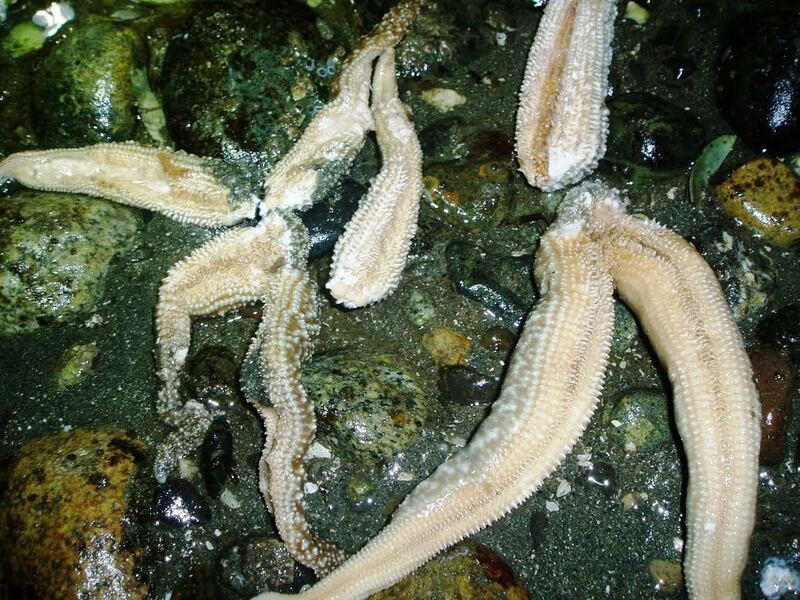 “Densovirus associated with sea-star wasting disease and mass mortality” initially suggested a link between a densovirus (SSaDV) and sea star wasting syndrome (SSWS) but subsequent work revealed that an association between a viral pathogen and SSWS was unlikely in any species other than Pycnopodia helianthoides. Thus, there is still much work to be done before this mysterious disease is fully understood. Molecular sequencing of samples is underway at Cornell University to identify possible causative agents. Current thinking is that there is likely a pathogen involved, but environmental factors may also play a role, and contributing factors might vary regionally. There is no evidence linking the current wasting event to the ongoing disaster at the Fukushima nuclear facility in Japan. The first photograph in the below series of a sea star with wasting syndrome was taking on June 27th, 2014 on Guemes Island, Washington. The following picture was taken a day later, and the last picture, the day after that. These sequential photographs of a single individual demonstrate how quickly the disease can progress and the extent of damage that can be done in only three days. 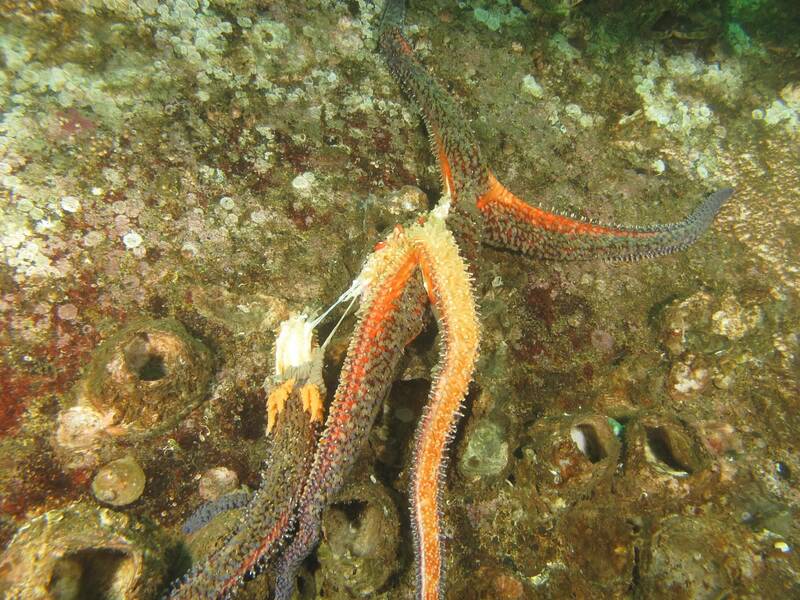 Sea star wasting syndrome is a general description of a set of symptoms that are found in sea stars. Typically, lesions appear in the ectoderm followed by decay of tissue surrounding the lesions, which can lead to eventual fragmentation of the body and death. A deflated appearance can precede other morphological signs of the disease. 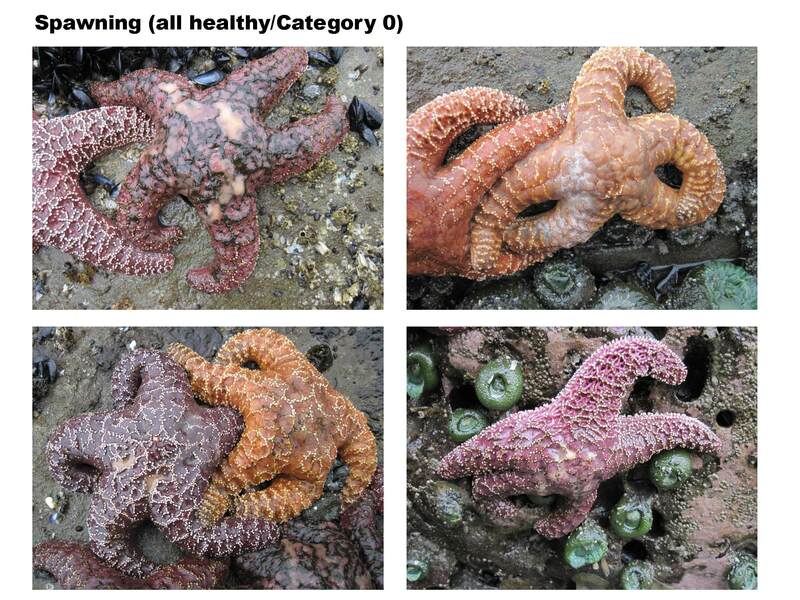 All of these symptoms are also associated with ordinary attributes of unhealthy stars and can arise when an individual is stranded too high in the intertidal zone (for example) and simply desiccates. “True” wasting disease will be present in individuals that are found in suitable habitat, often in the midst of other affected individuals. The progression of wasting disease can be rapid, leading to death within a few days, and its effects can be devastating on sea star populations. 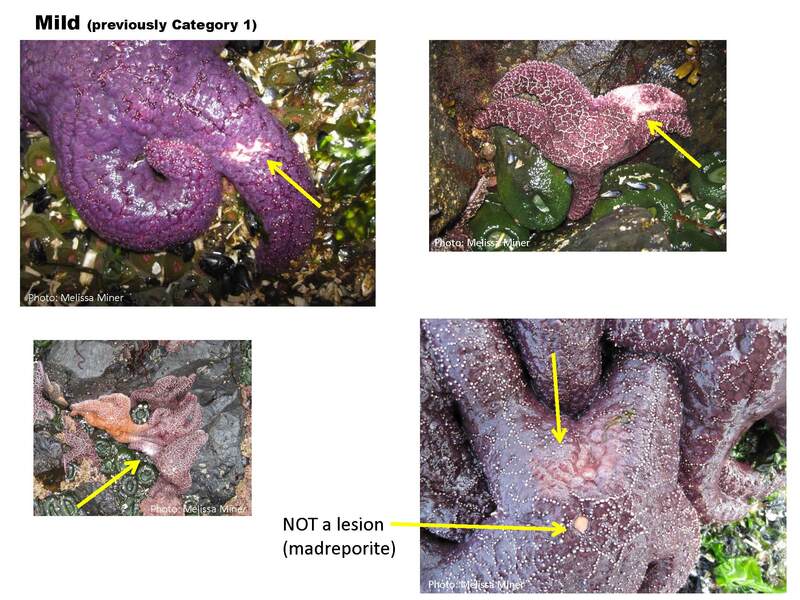 The current bout of SSWS was first noted in ochre stars (Pisaster ochraceus) in June 2013 along the coast of Washington state during monitoring surveys conducted by MARINe researchers from Olympic National Park (ONP). MARINe monitoring groups, in collaboration with citizen science groups, have since documented wasting in sea stars from Alaska through California (see wasting map for specific locations). In August 2013, divers investigating subtidal habitats reported massive die-offs of sunflower stars (Pycnopodia helianthoides) just north of Vancouver, British Columbia. Shortly afterwards, other subtidal sea star species in the region began showing signs of wasting. During October and November 2013, a similar mass death of sea stars occurred in Monterey, California, with another die-off of sunflower and ochre stars around Seattle, Washington, with the syndrome spreading throughout the Puget Sound. In mid-December 2013, substantial numbers of wasting stars were spotted around southern California, and by the summer of 2014 the disease had spread to Mexico and Oregon. Photo credits: Mark Nayer (left), Michael Kyte (right). In subtidal habitats, the sunflower star is typically the first species to succumb, followed by the rainbow star (Orthasterias koehleri), giant pink star (Pisaster brevispinus), giant star (Pisaster giganteus), mottled star (Evasterias troschelii), ochre star (Pisaster ochraceus) and sun star (Solaster), leather star (Dermasterias imbricata), vermilion star (Mediaster aequalis), six-armed stars (Leptasterias), and bat star (Patiria miniata). We don’t know whether the syndrome spreads sequentially from one species to the next, or if some species simply take longer to express symptoms, but the usually large populations of ochre and sunflower stars experienced massive, geographically expansive (if patchy) and well-documented declines. Other species are less abundant, so the impact of the syndrome is not as clear. Ecologists consider both sunflower and ochre stars to be keystone species because they have a disproportionately large influence on other species in their ecosystem. 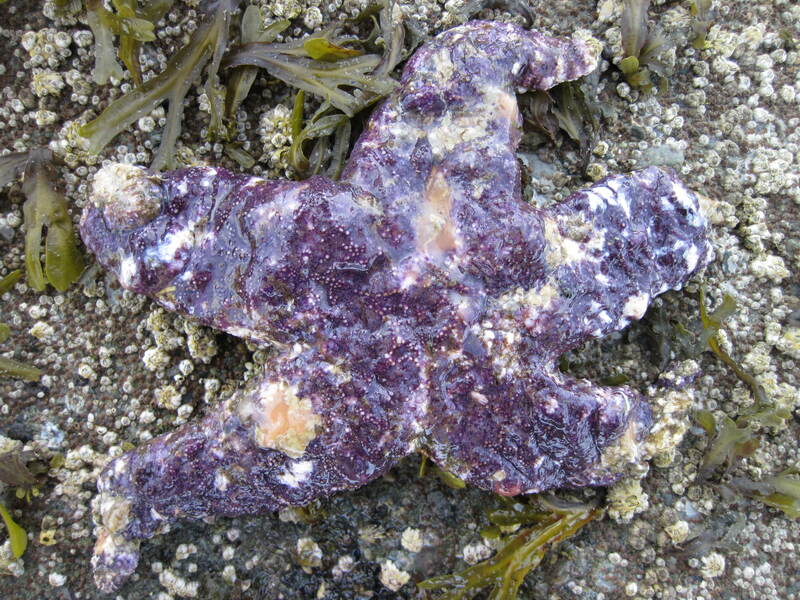 In fact Pisaster ochraceus was the basis of the keystone species concept because of its potential to dramatically alter the rocky intertidal community in which it occurs. Our long-term monitoring data, including population estimates prior to the wasting event, in combination with our biodiversity surveys, will allow us to interpret change to communities that might result from severe population declines of P. ochraceus. 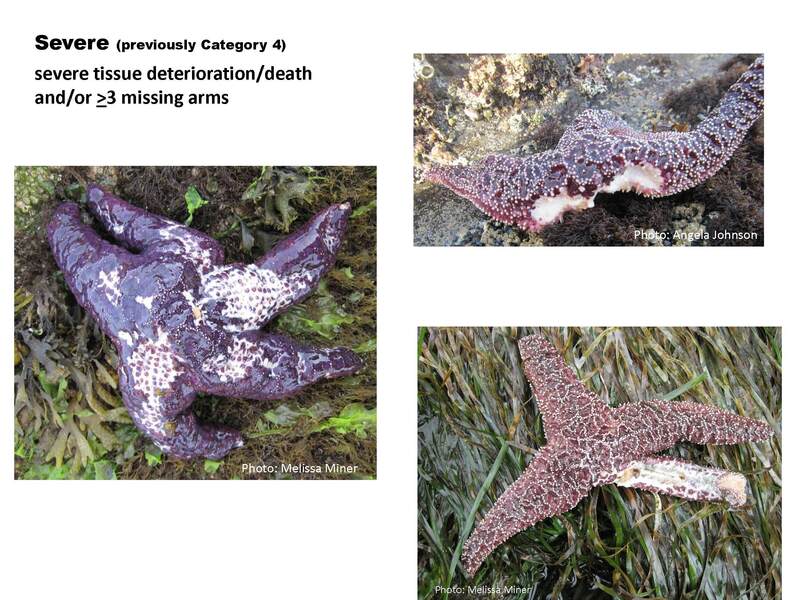 The collected information will also be used to document recovery of both sea star populations and the community affected by way of the loss of sea stars. 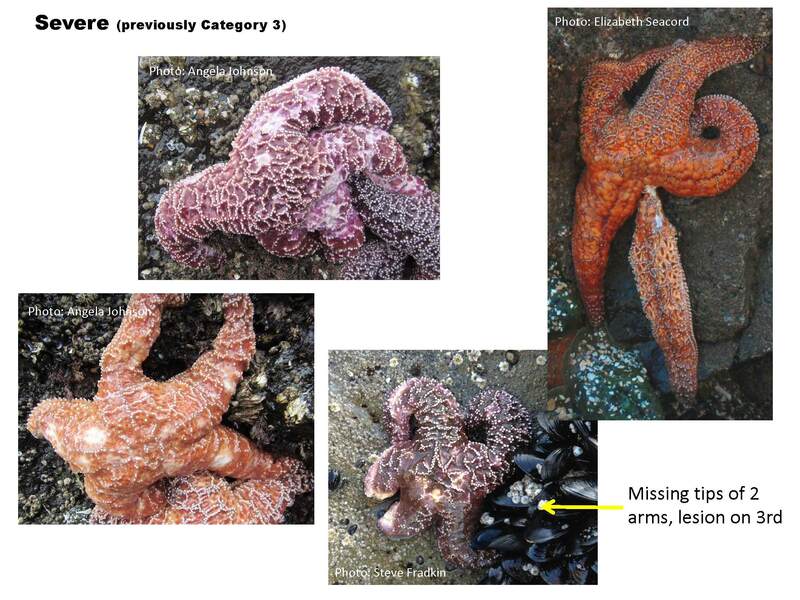 Long-term trends in Pisaster ochraceus numbers at our monitored sites can be viewed by location here or by using our Interactive Map & Graphing Tool. Under "Long Term Graph Type" select "species counts data" and under "plot type" select "pisaster". 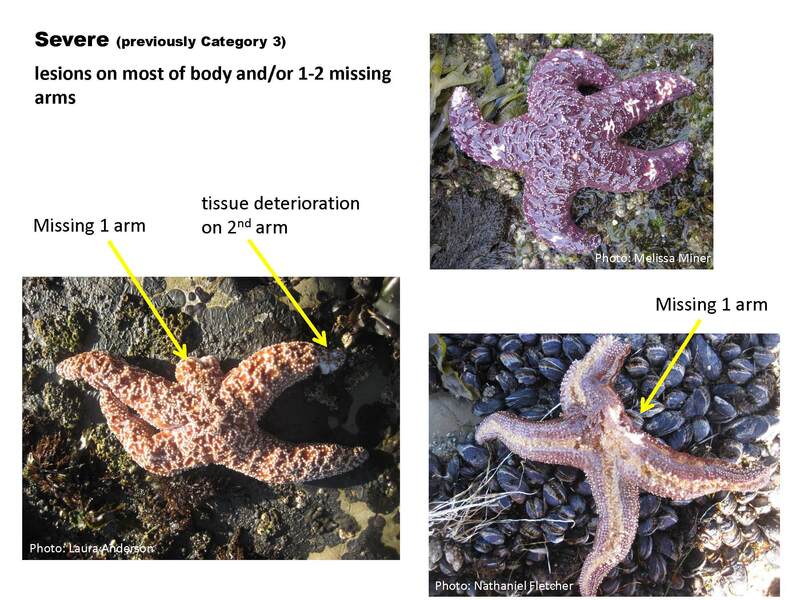 Documenting the presence of sea star wasting symptoms by means of reports submitted by the general public, collaborative monitoring done by citizen science groups, and our own sampling as part of MARINe Long-Term Monitoring. Assessing the direct impact of SSWS on intertidal sea star populations, and the outlook for recovery. Assessing how the severe decline of sea stars impacts the distribution and abundance of other species in the rocky intertidal community, and how these impacts might vary by location. Other research groups are addressing the pathology and infectiousness of wasting. These groups include Cornell (Harvell & Hewson), University of Rhode Island (Gomez), Brown (Wessel), Western Washington University (Miner), and Seattle Aquarium. 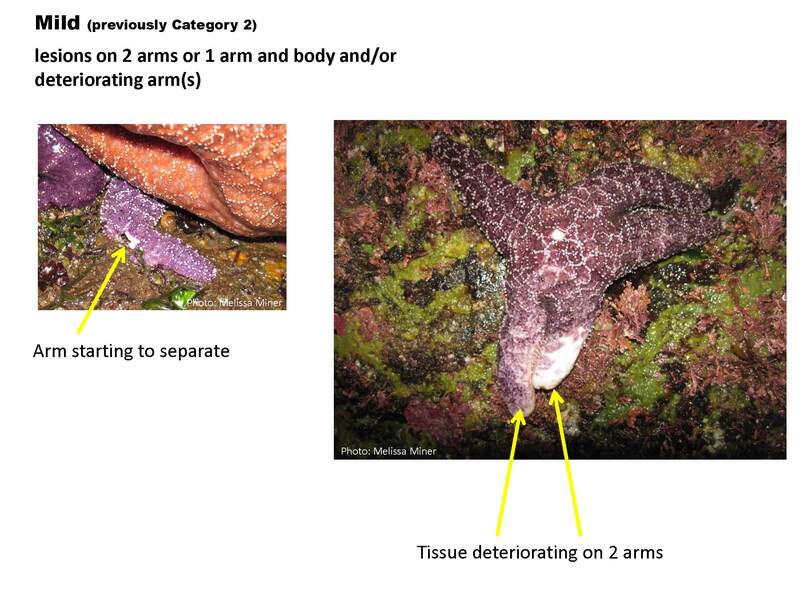 If you are interested in adding information to our Sea Star Wasting Syndrome Map, please see the options below. Click here to submit observations through our web form. If you have any photos or spreadsheets to send, please send them here. Please continue to submit observations after spending time diving or exploring the intertidal. We regularly update our website with the latest reports, as well as the SSWS tracking map. Please remember to fill out a log even if you search and only find healthy sea stars, or no sea stars! This information is just as valuable as observations of diseased individuals. Below are the different categories that we are using to document the stage of the disease. 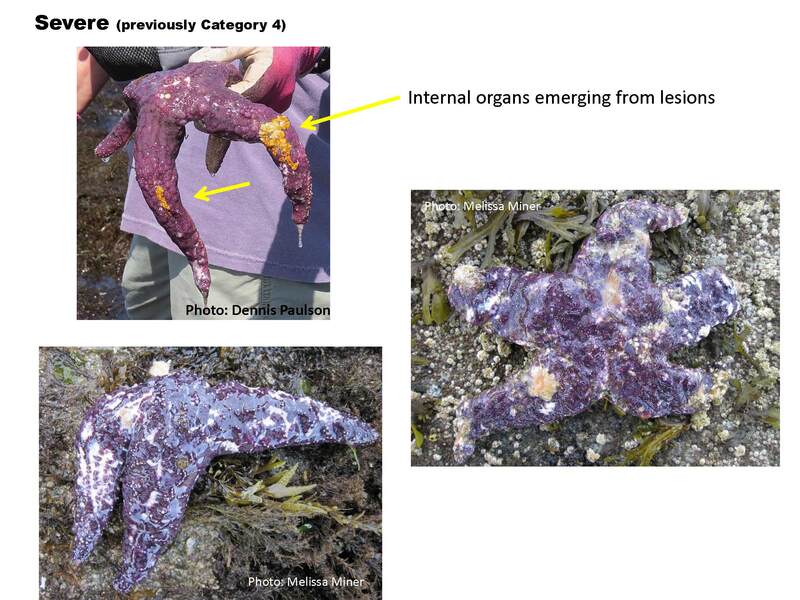 If you are interested in collecting additional information about sea star counts, sizes, and disease categories, please contact Melissa Miner, Rani Gaddam, and Melissa Douglas for details. We would like to increase the number of sites where long-term sea star data are collected, but in order to ensure data consistency, it is essential that a MARINe researcher is involved with initial site set-up and sampling. Note that data submitted to us may be used by our research group for analyses, as well as by others who submit data requests to us. If you have any concerns about this, please contact us. 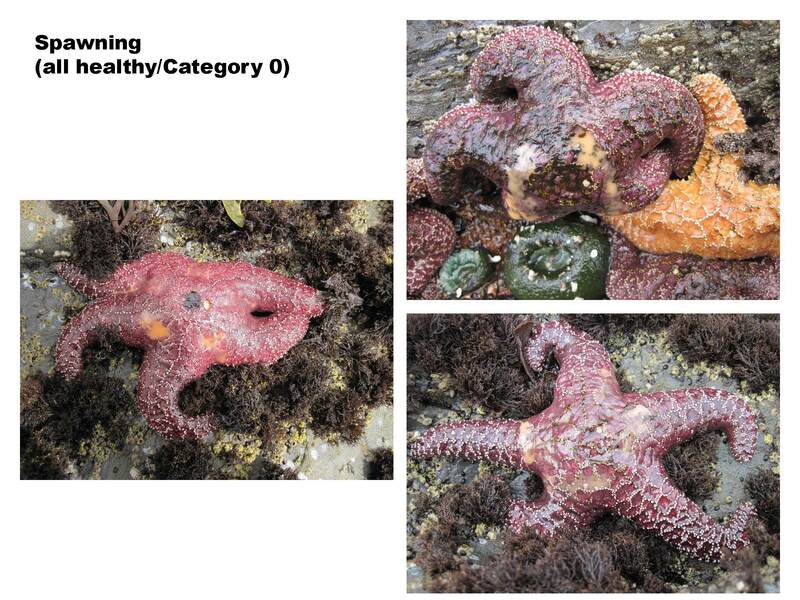 Download the intertidal sampling protocols (PDF). Download the subtidal sampling protocols (PDF).